Home » VectorVest » Buy Gem Diamonds #GEMD says VectorVest. A spectacular series of diamond recoveries continues to drive growth. Buy Gem Diamonds #GEMD says VectorVest. A spectacular series of diamond recoveries continues to drive growth. By Alan Green in VectorVest on 6th June 2018 . London-based Gem Diamonds (GEMD.L) is a leading global diamond producer of high value diamonds. The Company owns 70% of the Letšeng mine in Lesotho and 100% of the Ghaghoo mine in Botswana. The Letšeng mine is famous for the production of large, top colour, exceptional white diamonds, making it the highest dollar per carat kimberlite diamond mine in the world. 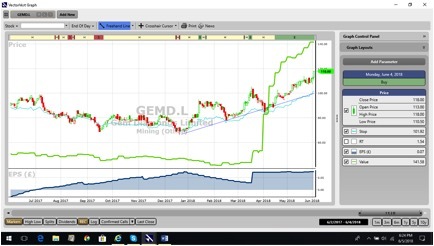 On April 26th2018, GEMD published a Q1 trading update, and said during the period Jan 1st2018 to 31stMarch 2018 seven diamonds greater than 100 carats were recovered. The Lesotho Legend, a high-quality 910 carat, D Colour Type IIa diamond, which was recovered on 15thJan was sold on 12 March for US$40m (US$ 43 912 per carat). This is the second largest gem quality diamond recovered in the past century and the largest diamond recovered to date at the Letšeng mine. 16 diamonds sold for more than US$1m each, generating revenue of US$70.7m during the period. GEMD also said a formal sale process has commenced to sell the Ghaghoo mine. The Group had US$91.3m of cash on hand (US$ 66.7m attributable to Gem Diamonds) and net cash of US$48.1m (US$ 28.9m attributable to Gem Diamonds) at the end of the Period, compared to the Q4 net cash position of US$1.4m. CEO Clifford Elphick said:…” It is encouraging to see the improvement in the frequency of large diamond recoveries during the Period with seven diamonds greater than 100 carats being recovered, supported by strong production results driving an 8% increase in carats recovered. The market for Letšeng’s high-quality diamonds has remained robust over the Period, achieving an average price of US$ 3 276 per carat, up 48% from the previous quarter.”Separately on May 22nd2018, GEMD announced the recovery of a 115 carat, top white colour Type IIa diamond from the Letšeng mine. This is the ninth diamond of over 100 carats recovered in 2018, already exceeding the total number of diamonds of over 100 carats recovered in 2017. In early April 2018, prior to the results announcement, VectorVest flagged the RT (Relative Timing) metric for GEMD, providing early indication of more to come from the steadily rising share price (RT is a fast, smart, accurate indicator of a stock’s price trend). Today at 118p the GEMD RT metric still logs a rating of 1.54, which is excellent on a scale of 0.00 – 2.00. Other high scoring metrics include a GRT (Earnings Growth Rate) of 24%, which VectorVest also considers excellent. Despite trading at year highs of 118p, VectorVest still sees more to come, attributing a current value of 142p. The chart of GEMD is shown above in my normal format. The share was revalued by VectorVest in April 2018 as EPS improved markedly over the past year. The share is trending higher and is on a BUY recommendation on VectorVest after charting a rounded or a saucer bottom over the past year. Readers can examine trading opportunities on GEMD and a host of other similar stocks for a single payment of £5.95. This gives access to the VectorVest Risk Free 30-day trial, where members enjoy unlimited access to VectorVest UK & U.S., plus VectorVest University for on-demand strategies and training. Link here to view.